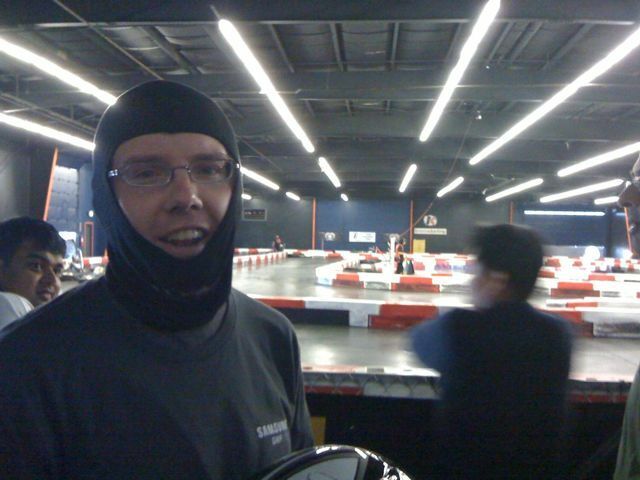 My work had a team-building event today where they brought us to an indoor go-cart track and set us loose for a while on a twisty course with gas-powered carts. I raced 40 minutes of an hour-long race on a three-person team, and had a car change about halfway through because my throttle broke. Then I spent the last part of the race in a sliding car with cold tires. I finished the practice round in second, but finished sixth in the full race. Overall, it was a lot of fun, although it left me sore as hell, and made the commute home interesting. I kept wanting to slam into turns and shave corners. The whole experience reminded me of snowmobiling in Alaska, down to the annoying helmet. If you ever have the chance to do this, here is one big tip: when the track safety guys blue flag you and tell you to let the guy behind you pass, ignore them. I actually let people pass when I got flagged, and I was the only one who did.